How do you go about creating a space to support collaboration, creative problem-solving and innovation? Two institutions share their experiences. 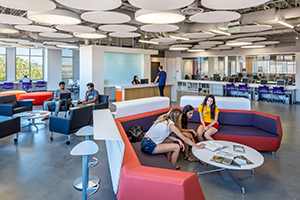 Susan Metros vividly remembers the blank slate that would become the "Garage," a new learning space for the University of Southern California's Iovine and Young Academy for Arts, Technology and the Business of Innovation. In 2013, entrepreneurs Jimmy Iovine and Dr. Dre (aka Andre Young) had given $70 million to create a unique undergraduate program that promotes new kinds of learning through cross-disciplinary and hands-on discovery, in a fully immersive and collaborative learning space. The space for the new program, on the fourth floor of the Ronald Tutor Campus Center, was completely undeveloped. "I remember going to a meeting and there was no electricity," said Metros, associate dean of the academy. "We really got to start from scratch." The space was an open canvas for innovation, yet the timeline was aggressive — with only three months for design and five months for construction. Members of the design team, including the dean, traveled to look at other universities' innovation spaces and makerspaces, as well as spaces in the Newseum in Washington, D.C. 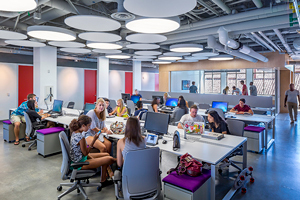 In her previous position as vice provost of technology-enhanced learning, Metros had led a group charged with reimagining learning spaces on USC's campus. "We knew we didn't want a classroom with four walls or a lecturer in front," she said. "We knew we wanted to have students be in a classroom where if the faculty member posed a question or challenge, the students could go and make something and bring it back to class, and not have to wait until the next week. Rapid iteration was paramount in terms of creative problem-solving and design thinking. 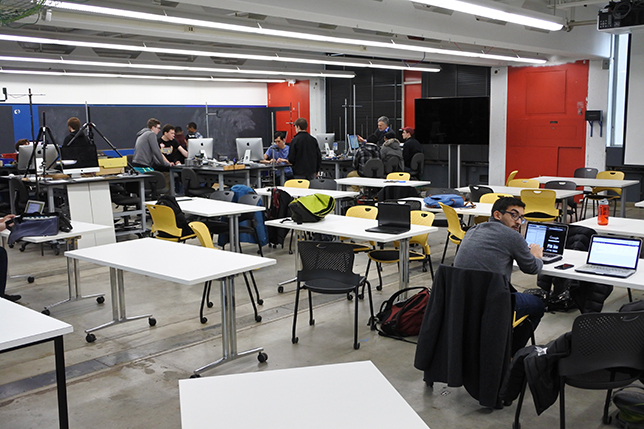 From the beginning we knew the space had to be flexible, so that students could learn, make things and collaborate, and it had to be a place where creativity could evolve. Our dean calls it 'accidental collisions.'" An expansive balcony overlooking the Tutor Campus Center courtyard. Metros said it was important to find an architecture firm that was receptive to a different design process. USC worked with Steinberg Architects, which came in and created "mood boards" to cluster design ideas. "Instead of saying we want a place to do 3D printing or a place for students to sit and talk, we turned it around and said what is the feeling we would like," Metros explained. Vetting those ideas turned out to be a challenge: Since the team was designing the space before the program started, there were no current students to offer feedback (although a few design students participated). There were also some ideas, such as movable walls, that were deemed too expensive or impractical, Metros said. "I learned the term 'value engineering': We called it design and they called it embellishments." When the initial class of students in the program arrived on campus, one of their first assignments was to re-envision the space. What changes would they make? It is an oddly shaped space, a rotunda with a giant air vent in the middle — and the students immediately started drawing on the air vent. "It became this mural, a visual chronicle of their experiences, which is pretty cool," Metros said. The program, which has approximately 25 students in each class, is now in its second year, and the space has received good reviews from the early students. Louis Harboe of Chicago told the USC news service that the Garage "mixes good design and good technology, which fits perfectly with the program." And the type of collaboration originally envisioned for the space is happening, said Metros. Students now work together on projects both inside and outside class, and you can't tell the difference, she said. Students have been amazingly enterprising with the space, added Metros. For example, when they saw there was no place to put skateboards, they created a prototype skateboard rack out of cardboard, went to a wood shop and got certified to use it, and built and painted their own rack. "They are neat kids," she said. "We were looking for innovative, special people and they have put the space to the test." Of course, there are always unforeseen challenges with new spaces. Administrators hadn't anticipated that students would want 24/7 access. "We shouldn't have been surprised," Metros said, "but we didn't have funding to have someone watch it all night. Students were finding all kinds of ways to sneak in, so we had to have a serious talk about safety and security. Students really want to be in that space." Metros believes more spaces like the Garage are needed. "It is surprising that universities think that students should go to a class for 50 minutes and then walk out and have no spaces that they can call their own," she said. "They don't have a space to go in the evenings and on weekends to really think about and critically solve problems. The Garage has become that space." Sometimes faculty members can take the reins in efforts to create a different type of learning space. A few years ago, Harvard University physics professor Melissa Franklin toured the campus trying to find a space where you could actually make anything. She wasn't very successful. But she did find some "black box" spaces where students would put on plays. One used to be a swimming pool. "These spaces are great because they can be changed to be anything," she said. "Nothing is fixed." She came up with the idea of a black box theater that is also a laboratory. "I wanted a space where it would feel like you could do whatever you wanted, and it would have an industrial feeling. Nothing would be fixed and nothing would be hard to move." With a grant from the Harvard Initiative for Learning and Teaching (HILT), Franklin and colleague Logan McCarty set out to turn a 2,500-square-foot space in the Science Center into an experimental "black box" classroom called the "SciBox." Their first move was to rip everything out — and not paint the walls. They wanted an unfinished feeling to the space, which is half-classroom, half-lab. "I wanted it to feel like you could do anything," Franklin said. "You can write all over the walls, and the furniture is totally light and movable. Every time people come in they change the setup." The SciBox opened in spring 2013. Besides a workshop, lab and classroom, the space features a "beach" — a couple of comfy couches (on wheels) where students can sit and think. It also sports a huge flat-screen TV on wheels. Although the SciBox space has been popular with science teachers, others such as drama groups use it as well. "The theater people come in and do anything, break things, which I love," Franklin added. "The physics students are more timid, which is interesting." The SciBox was such a hit that the Science Center has created two similar spaces on the first floor. "We did the same thing to two classrooms, with everything movable, and I got e-mails from people saying this is what we need," Franklin said. Those spaces also are popular with other campus groups. For instance, Franklin said, math help sessions used to be held in older classrooms with fixed desks. Freshmen would go in and sit, waiting for someone to help them and not working with each other. "I encouraged the math department to use one of these spaces at night and they said it totally transformed the help sessions." Franklin noted that it is not always easy to put new ideas into practice. "I have a lot of ideas, and sometimes it takes too much energy to convince people to do it," she admitted, but she called the change to more flexible classroom spaces low-hanging fruit. "You don't have to be a mad genius to figure this out."